The Aradhana of one of the most famous and scholarly seers of the Mantralaya Sri Raghavendra Swamy Matha, Jitamitra Theertha, is being celebrated at Shri Jitamitra Gadde, Shivpur, Yadgir Taluk, Gulbarga district from December 31. The Aradhana will be spread over three days and this is the 521st Aradhane of this great seer. He succeeded to the Sri Matha after Vibhudendhra Theertha entered Brindavana in Tamrapani in Tamil Nadu. He was followed to the peetha by Raghunandana Theertha. He is believed to be an amsha of Rudra Devaru. He planted a gum tree in Bichale near Mantralaya. The original gum tree in Bichale was destroyed when the Tungabhadra flooded and entered Bichale and the Japada Katte where the tree had been planted. Unlike many others seers, Jitamitra Theertha did not enter Brindavana. He disappeared into the gum tree under which he taught students in Jitamitra Gadde. The Gadde is a small but beautiful island at the confluence of the Bheema and the Krishna. Jitamitra Theertha is 12th Pontiff from Madwacharya. . The Aradhana will be held on Dec 31, 2013, January 1, 2014 and January 2, 2014. On January 1, 2014, Suyateendra Theertha and Subhudendra Theertha will participate in the Aradhane celebrations and the Sri Samsthana pooje will be performed by the seers. There are many compositions by Srishakeshava Vittala Dasaru on Raghavendra Swamy or Rayaru (1595-1671). He was a devotee of Raghavendra Swamy and he visited Mantralaya, the abode of Rayaru, several times. The lyrics of all three songs are in Kannada. One of the foremost Haridasa is Vijaya Dasa (1682-1755). It is he who is responsible for the second coming of the Haridasa Sahitya or Dasa Koota which was founded by Vyasa Raja or Vyasa Theertha (1447-1539). Vijaya Dasa received his ankita from Purandara Dasa and it was in a dream. According to belief, Vijaya Dasa was Madhwapati Dasa in his earlier avatar and he took birth to write 25,000 compositions. It was this Haridasa who first enlightened the world about the hidden facts of Raghavendra Swamy and threw new light on the Mantralaya seer’s holiness and saintliness. Vijaya Dasa saw Rayaru several times in the Brindavana in Mantralaya and he has written several compositions on this aspect. This is a small but beautiful poem on Rayau as Vijaya dasa saw him one day when he visited Mantralaya. This composition is titled Raghavendra guru pAvanakaya and it is a small eulogy on Rayaru. There are several other poems that Vijaya Das has written on Rayasu but this is the shortest and it is easy to memorise and recite. 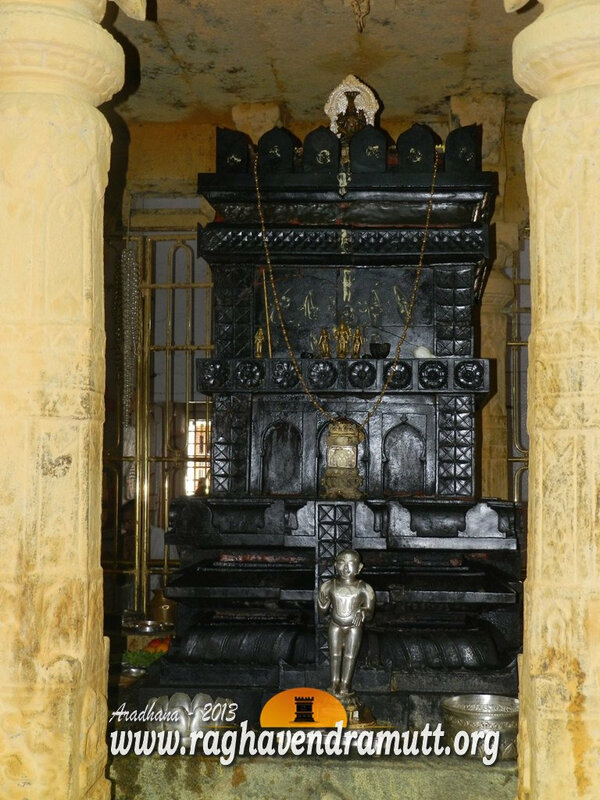 Vijaya Dasa was a frequent visitor to Mantralaya and also Bichale where Raghavendra Swamy stayed for thirteen years from 1658 till he entered Brindavana in 1671. Vijaya Dasa also visited the Panchamukhi Hanuman temple in Gandhal where Rayaru sat and meditated. It is at this temple that Hanuman gave his darshana to Rayau as a five-headed monkey God. Hence, the name Panchamukhi (five faced) Hanuman. While Mantralaya is in Andhra Pradesh, both Gandhal and Bichale are in Karnataka. Gandhal and Bichale can be seen in a day and there are plenty of shared autorickshaws and tempos from Mantralaya to both these places. Apart from the Vijayadasara Katte in Chikalparvi, there is another similar katte in Adoni or Adwani. Both are in Andhra Pradesh and we get Adoni when we travel to Mantralaya from Bangalore on the Andhra Pradesh route (Anantapur-Penukonda). Raghavendra Swamy or Rayaru (1595-1671) is perhaps one of the most well-known saints in the world and his fame has spread far and wide. A staunch Dwaitha, Raghavendra Swamy was a scholar par excellence. He has several works to his credit. Tow of his most famous songs are “Indu Enage Govinda” which he composed when he saw Sri Krishna at Udupi. Another famous song is the one on Vayu Devaru or Hanuman. In his previous avatar as Vyasa Raja, he had consecrated 732 idols of Hanuman all over the VijayanagarKingdom. As Raghavendra Swamy, he consecrated three idols of Hanuman. There is also an idol of Hanuman in front of his Brindavana in Mantralaya. This idol was consecrated by his successor to the Mantralaya Matha, Yogendra Theertha (1671-1688). Here is the Kannada lyrics of the composition on Hanuman composed by Rayaru. Talk of Raghavendra Vijaya and the name that immediately comes to our mind is that of Narayanacharya, a relative of Raghavendra Swamy or Rayaru (1595-1671). Narayanacahrya was a scholar and poet. He was the son of the sister of Raghavendra Swamy. His Vijaya is a long narrative encapsulating the life and times of the saint of Mantralaya. However, there is another work by the same name and this one is written centuries after the composition of Narayanacharya. This work too is called the Raghavendra Vijaya and it is composed by Guru Jagannatha Dasa (1837-1918), a leading Haridasa. Guru Jagannatha Dasa, who is credited with the maximum number of songs on Raghavendra Swamy or Rayaru, was an ardent devotee of Rayaru. Guru Jagannatha Dasa is different from Jagannatha Dasa of Manvi. If Jagannatha Dasa of Manvi wrote the Sriharikathamrutasara, Guru Jagannatha Dasa wrote commentaries on it. The Raghavendra Vijaya of Guru Jagannatha Dasa is a very beautiful work which encompasses all the avatars of Rayaru and it also describes him physically. It is rather similar to the Raghavendra Tantra of Krishna Avadootaru in the sense that this work tells us how to get the blessings of Rayaru. The work tells us that the best and easiest manner in which to ensure that the blessings of Rayaru will be on us is to perform Pradakshina and seve with pure heart and pure mind. “Be sincere and devoted and Rayaru will reward you”, says Guru Jagannatha Dasa. The Raghavendra Vijaya is in nine chapters or sandhi and each is devoted to a different aspect or avatar of Rayaru and his mahime. The first chapter is general in nature and it tells us about the holiness and sanctity associated with Rayaru and how he has cured many diseases. The second chapter is on Prahalada, the first avatar of Rayaru. There is the story of the demon, Hiranyakashipu, and how Bhoodevi or the Goddess of Earth, prays to God to lessen the burden of evil represented by the demon. The entire story of Hiranyakashipu, the birth of his son, Prahalada, the education of Prahalada and the death of the demon is vividly described. The third sandhi is on Vyasaraja or Vyasa Theertha, the second avatar of Rayaru. The chapter starts with the village of Bannur near Mysore where Vyasa Raja is born as Yathiraja. Here, Dasaru says that Bramanye Theertha blessed a couple to have pious children and thus was born the future Vyasa Raja. It says Vyasa Raja was taken away on a golden plate by Bramanye Theertha from Bannur and that the child started studying from the age of five years. The fourth chapter too deals with Vyasa Raja. Here, we get the information that the thread ceremony or Upanayana of Vyasa Raja was performed when he was eight years old. Bramanye Theertha also names Yathiraja as Vyasa Raja. The fifth sandhi continues with the life and times of Vyasa Raja and his works. The chapter contains the mahime of Vyasa Raja and the many miracles that he had performed. There is also a beautiful description of the lake built by Vyasa Raja which exists even today. It is called Vyasa Samudra. The chapter tells us the 12 years that Vyasa Raja spent in Tirumala praying to Lord Srinivasa and after which he proceeded to Hampi or Vijayanagar and consecrated the Yantrodahraka Hanuman at Chakratheertha. The sixth sandhi also deals with Vyasa Raja and his life in the Vijayanagar period. We get glimpses of the Dasa Koota and Vyasa koota established by Vyasa Raja and his interaction with Purandara Dasa and Kanaka Dasa. Dasaru also tells us how Kanaka Dasa showed Hari in the form of a dog in Hampi. He also relates the story of a beggar who asks for divine intervention and Vyasa Raja blesses him to write Sriharikathamrutasara. The seventh chapter is on Rayaru. Dasaru relates the tale of Rayaru and Manchale village which is now known as Mantralaya. The eighth chapter is also on Raghavendra Swamy and how devotees can benefit from his grace and mercy. The ninth and final chapter too is on Raghavendra Swamy and Dasaru has described the physical attributes of Rayaru and the magnetic personality that he had.